I stood in the close quarters of the tiny outfitter’s office with Jackie, the owner. “We have alligators and snakes here, just so you know,” she warned me, and then she demonstrated how to remove a snake from a paddle. Truthfully, alligators don’t bother me, but I’ve yet to encounter a snake in a Florida river—strange as that might seem after 28 rivers paddled. So, I listened and asked questions (“What kind of snakes?” “How big are they?”), secretly hoping that the cold weather would keep the snakes away. The Withlacoochee River. It sure is a mouthful to say. It’s a Native American term that means, “little big water” or “crooked river.” I understood, once I paddled it. During the drier season, when the water is low, the “small” river twists and turns through sometimes high banks. However, when the rains come, the water flows high and into the woods so that the banks disappear and the river appears “big.” Paddling in the dry season, I could see how the high waters had left their marks on the trees.The Withlacoochee originates in the Green Swamp, along with the Peace, Hillsborough, and Ocklawaha rivers—a few of my favorites. It travels west, then north, then west again, and it finally empties into the Gulf. 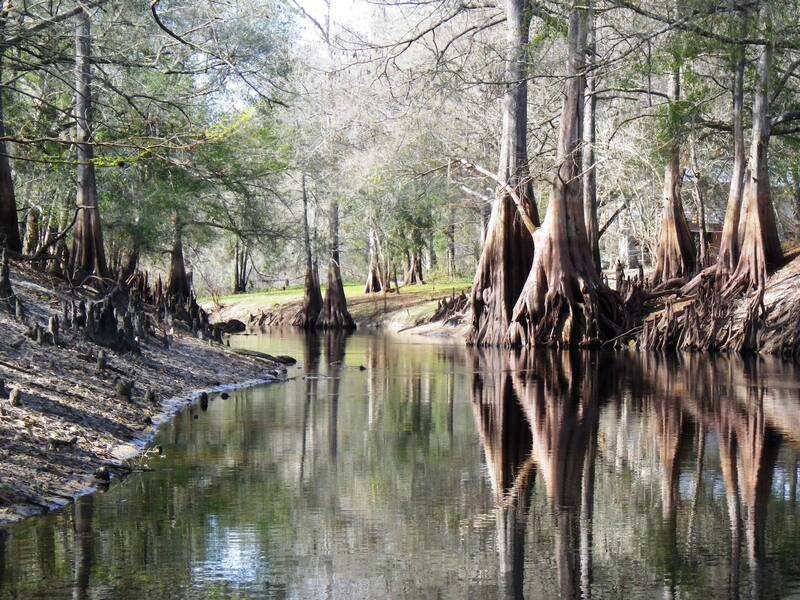 It is an Outstanding Florida Water and is more than 140 miles long. Eighty-three miles is also a designated Florida Paddling Trail. To get to the drop off, Jackie and I drove through the Richloam Wildlife Management Area in the Withlacoochee State Forest, scooting over on the dirt road to let hunters pass in their dusty pickups, hound dogs barking in cages in the back. If it had been later in the year, during the rainy season, I would have started my paddle several miles deeper into the Green Swamp at “High Bluff,” welcoming the extra couple hours of serenity and nature. However, during the dry season, that portion of the river becomes puddles in places and requires a lot of portaging, so Jackie dropped me at the Lacoochee Park put in. From here, I had several miles to paddle back to the outfitter located on SR 575 and another five miles to the Sawmill residences where Jackie would pick me up. I had layered up for a cool day of paddling—in the 60s when I began—brrr! I had added the “required” orange vest (to ensure I would not be mistaken for a deer or hog by the hunters). The crisp air felt good as I paddled the quiet river. For nearly two hours, only the screeches of the occasional red-shoulder hawk broke the silence. Earlier, Jackie had described the beautiful colors of the river in the springtime; however, even in its neutral shades of brown and gray, the river was beautiful—like an old photograph. Naked brown cypress clung to the banks while live oaks and red maples added bits of green and red to the landscape. 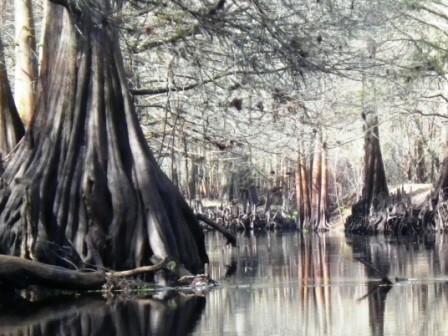 Cypress knees stretched to the sky as if in prayer—how appropriate for this ethereal habitat! Young ibis in various shades of white and brown, stood sentinel atop of the brown river banks while vultures cast ominous shadows on the river, perhaps circling a carcass hunters left behind. Black-crowned night herons, great herons, anhingas and egrets seemed to enjoy the river’s tranquility, watching quietly as I passed. Shortly before I paddled under SR 575, I saw the first house. After that, old wooden framed houses popped up on the banks here and there, and folks were out fishing. The low water created light turbulence in the water in some areas which made paddling fun. In one spot, I struggled to get my kayak through overgrown vegetation and fallen trees, but I managed to do it without stepping into the dark water and muck. Indeed, the cool weather had kept the critters away—no snakes or alligators on this trip! However, the Withlacoochee is definitely a river I’ll return to when the water is higher and the banks are green. I imagine I will see an entirely different river at that time.